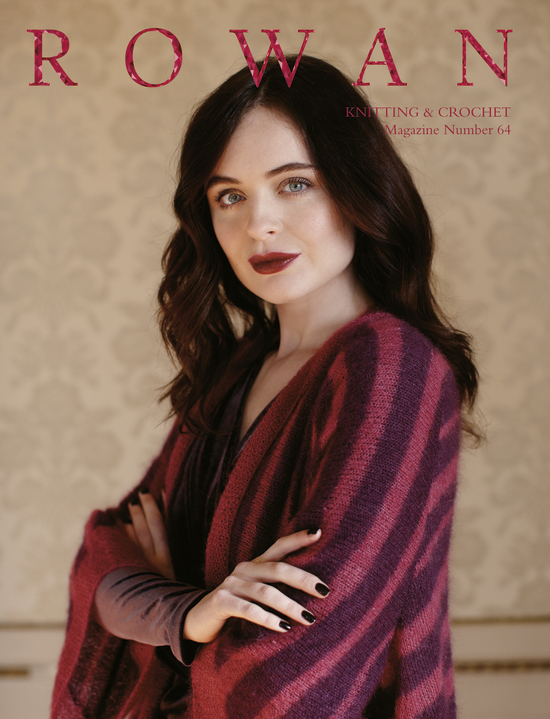 This year is the 40th Anniversary of Rowan and they are celebrating that fact with a design collection in their Knitting and Crochet Magazine Number 64 titled Ruby. The magazine is released today 1st August 2018. 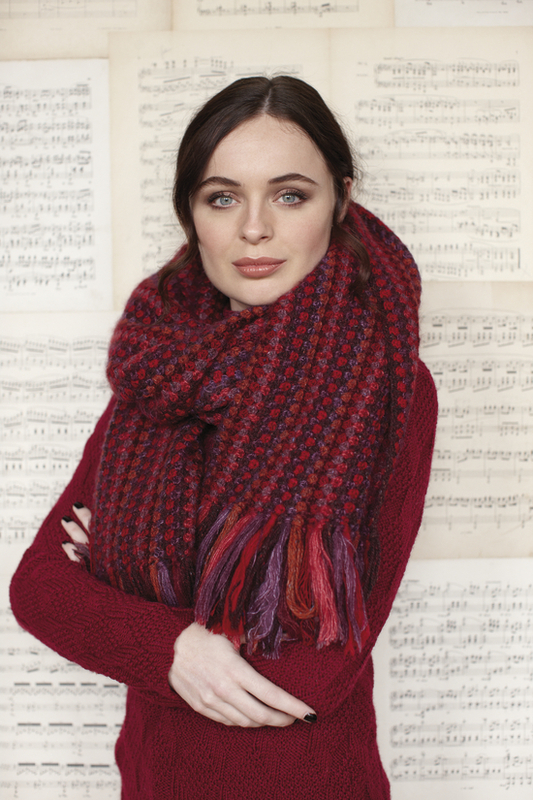 The Ruby Collection contains twenty designs all knitted in shades of ravishing red. Spectacular! Just take a look at the front cover; so striking! And on this front cover the duster cardigan designed by Zandra Rhodes is spectacular too. 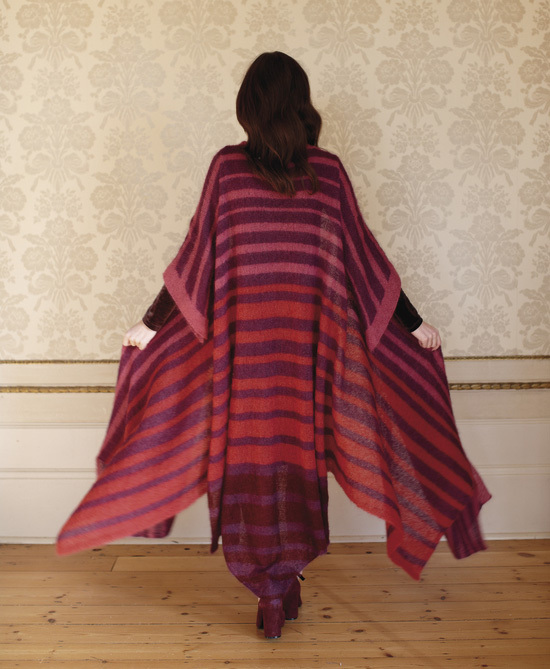 Just take a look…..
Now, I may not knit up Perinone but there is no denying that it is sumptuous. Here are some other designs that I like from the Ruby collection……. 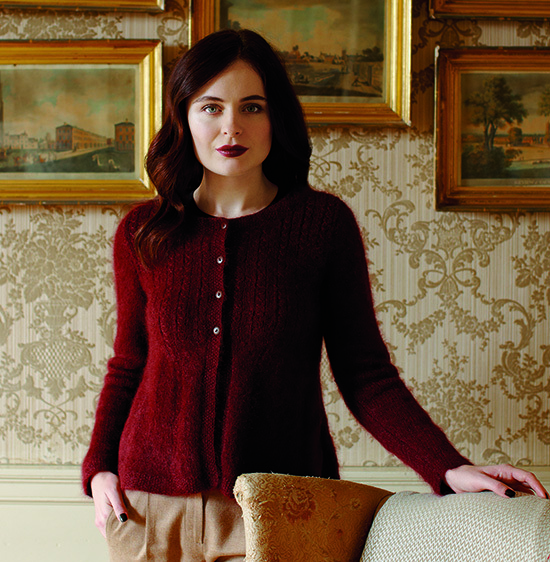 Vermillion designed by Sasha Kagan using Kid Classic, Valley Tweed, Kidsilk Haze, Felted Tweed and Cashmere Tweed. I am lucky that I can wear red, well, as long as it is a strawberry red (a blue-red) rather than a scarlet red (an orange-red), so the colour palette of the designs in Ruby do appeal to me. But if that is not the case for you, how do you substitute the shades for ones that will suit your skin tone? For some this is not easy to do as evidenced by the fact that if a design is photographed in a particular shade it is usually knitted up in that shade. Take Zandra Rhodes’ Perinone for example. 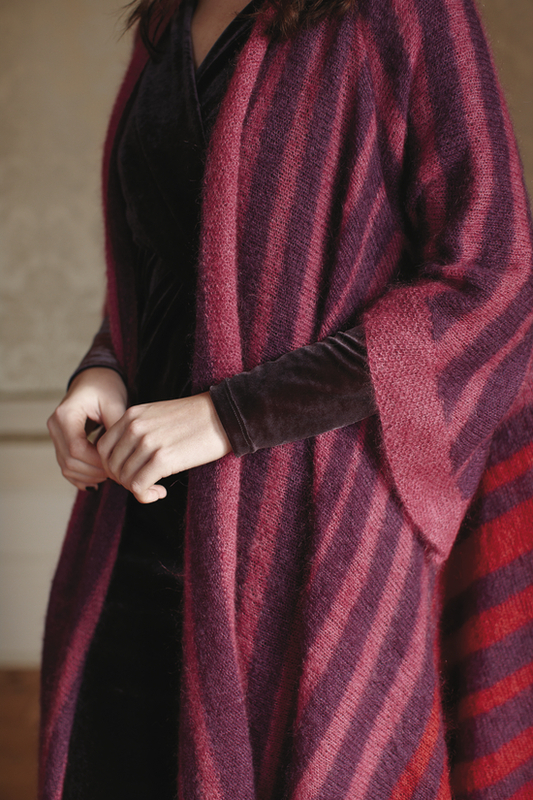 It is knitted using four different shades of Kidsilk Haze: Purplicious 678, Liqueur 595, Romance 681 and Blushes 583. None of the shades are light in tone, all mid to dark, so thinking about tone might be a good place to start when substituting four shades that need to work together. If you think a blue, for example, would suit you better choose four blue shades that are similar in tone to the four red shades. But beware, comparing colours on a computer screen is not a good idea as the shades will probably not display the true colour of each shade, although it can be a good starting point. A shade card can be helpful but it is best to go into a store which have all the shades available so you can see their true colour next to each other and make a better comparison. Place the balls of yarn close together and squint your eyes almost shut so you can no longer see the colour just the tone……just the lightness or darkness of each one. Now go and choose four blue shades and do the same trying to match the same combination of tone. You’ll probably not be able to get an exact tone match as you can see by my shades below: Bluebird 675, Hurricane 632, Heavenly 592 and Trance 582. Or how about lightening the tones a few gradations and choosing something more neutral and lighter: Pearl 590, Majestic 589, White 612 and Aura 676. Of course whatever shades you do decide to use you should really do a test swatch making sure they do all work together. Anyway, going back to the magazine, the other design collection is simply called Alpaca Classic, which is a new yarn from Rowan this season made of a cotton net filled with superfine alpaca fibres. 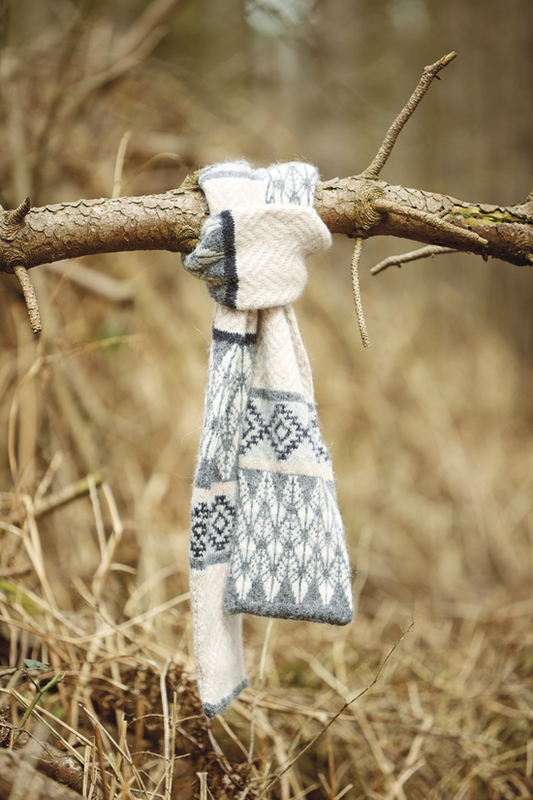 All the designs in this collection have been knitted using this yarn. I have picked out a few that I like, all designed by Lisa Richardson. There are a total of thirty-seven designs to choose from in this magazine. To see the full collection go to the Rowan website where you can also buy the magazine by becoming a subscriber. I imagine that as this is Rowan’s 40th anniversary this will be a very popular issue especially as so many people collect Rowan’s magazines and have all 64! Are you one of these people? Do you have all 64 Rowan’s magazines? Why not let me know by leaving a reply or comment below (click on reply or to read replies click on ? Replies) or scroll to the top and click on the little speech bubble! This entry was posted in Rowan Knitting & Crochet Magazine and tagged Alpaca Classic, Kidsilk Haze, Lisa Richardson, Martin Storey, Sarah Hatton by Esther. Bookmark the permalink. The above designs are very beautiful but for some readers, smaller items might be welcome. The models are tall and the items will take many hours of knitting. Ruby Anniversary Collection. I am petite and would be lost in the above items of clothing. The scarf appears to be the most user-friendly item to make. Also, I am beginning my “collection” for Christmas and Winter birthdays already. Two pairs of fingerless mitts will need a few stitches to complete and a hat may be next. Illustrations like the above do encourage inspiration so please note many of us look forward to your emails. Keep up the good work and the information on colours is invaluable. Thanks for your comments Carol and so pleased that you find my information on colour invaluable. But, if you want to knit something where fit is not important this magazine has 5 different wraps/shawls, 1 scarf, 1 cowl and a pair of fingerless mitts, so check out Rowan’s website to see them all. Esther.